As per the traditions of my people (my people = procrastinating nerdy illustrators), I'm posting a Christmas blog barely in time for the holiday. Today's drawing is an homage to the holiday season, the Aurora Borealis, and to Shotaro Ishinomori, the father of the Japanese Superhero. 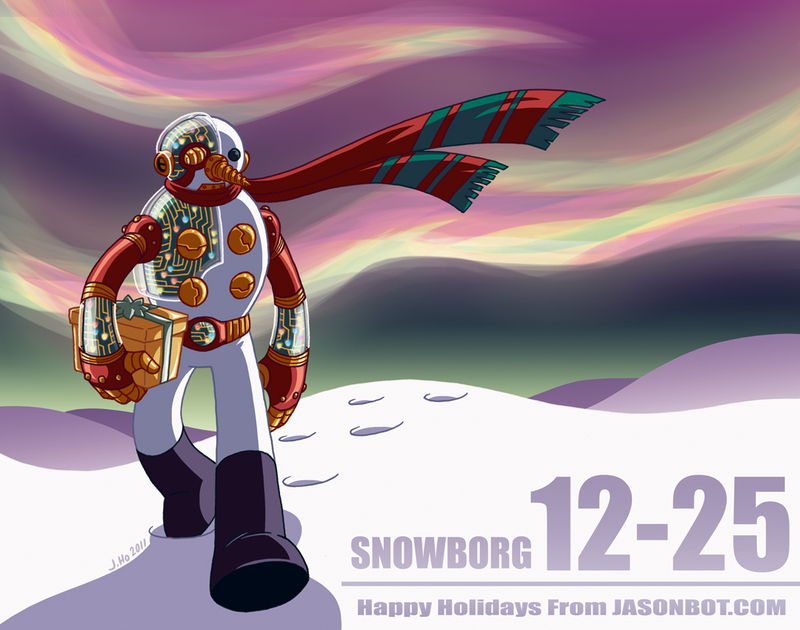 Ladies and gentleman, I present to you the cyborg snowman, SNOWBORG 12-25! This was supposed to be quick and simple, but I got really into making it SHINY in the coloring stage. Since I haven't been doing much digital coloring recently, I think maybe this was exactly the right thing to get me to brush the dust off the old tablet. Happy Holidays to you and yours, dear reader! I love this! A total Kikaider Style Christmas! Well done, my friend!!! :D Thank you--I'm so glad you like it!